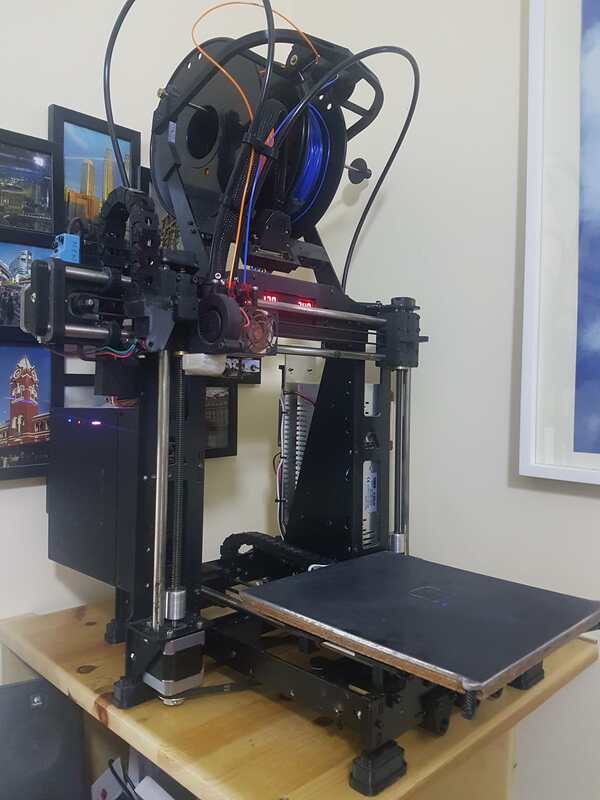 After getting my large Delta sorted I decided to upgrade my older steel-framed cartesian printer (which, I understand is similar to a Prusa i3). It still has some tweaking needed but it is now working so I thought I'd share some information about it as some of the modifications may help others. I'll provide some info on all these here, as well as the config files and other files that may be helpful. 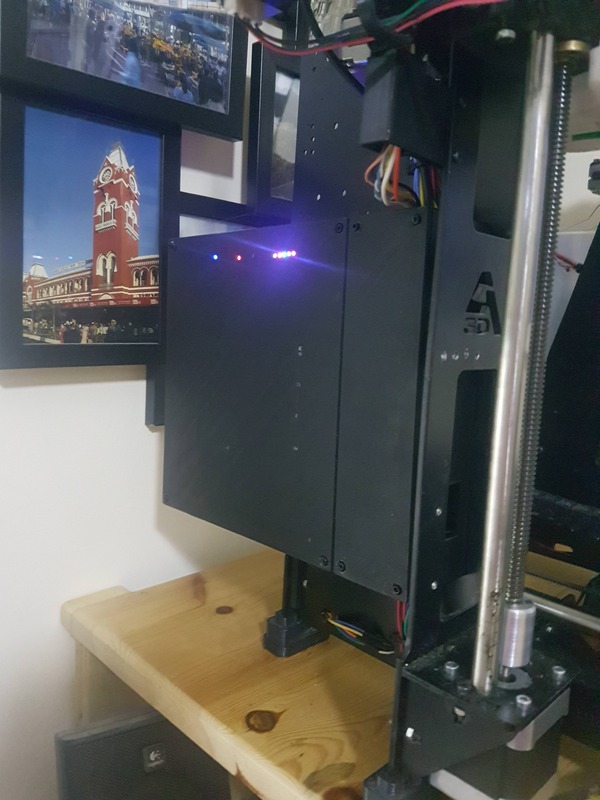 First a little teaser - this is the first print of the upgraded printer - a 20mm PLA square in alternate colours. The registration of the two nozzles is off in both the X and Y axis but that was easy to sort. The Duet case is published on Thingiverse so I won't go in to too much detail here. The X-axis ends are also on Thingiverse. These are designed for 10mm Oilite bronze bushes and 10mm stainless steel rods instead of the 8mm original rods and the linear bearings that I found to be noisy. 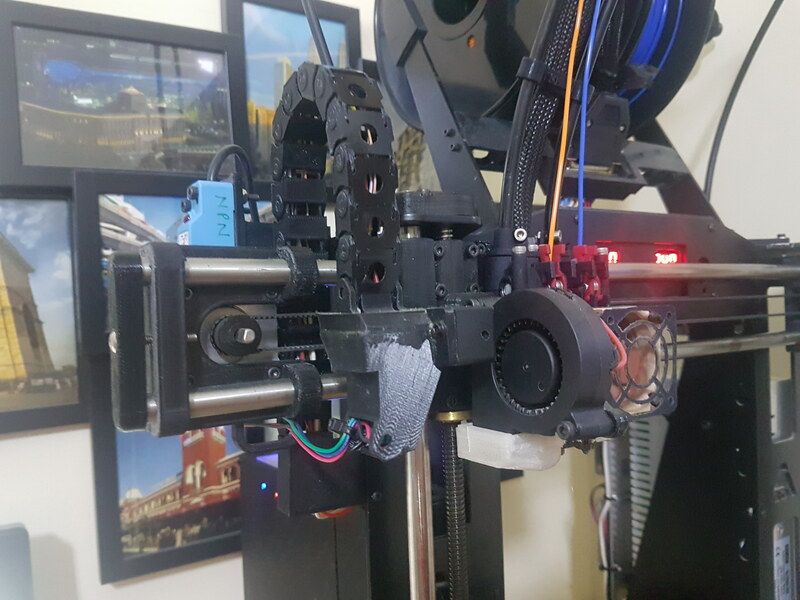 The X-carriage is on Thingiverse, too, and is designed to work with the X-end upgrade kit above. 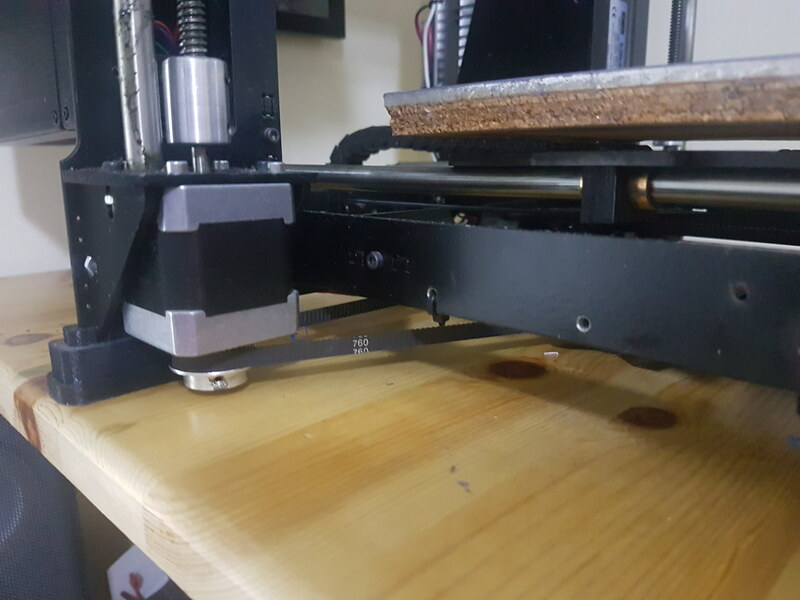 To maximise the Y-axis travel I designed and printed a new Y-motor mount that moved the motor rearwards to touch the rear frame. I then designed the heatbed and the heatbed carrier and had then water jet cut from 4mm aluminium (I am happy to publish the designs. Please contact me if you want them). 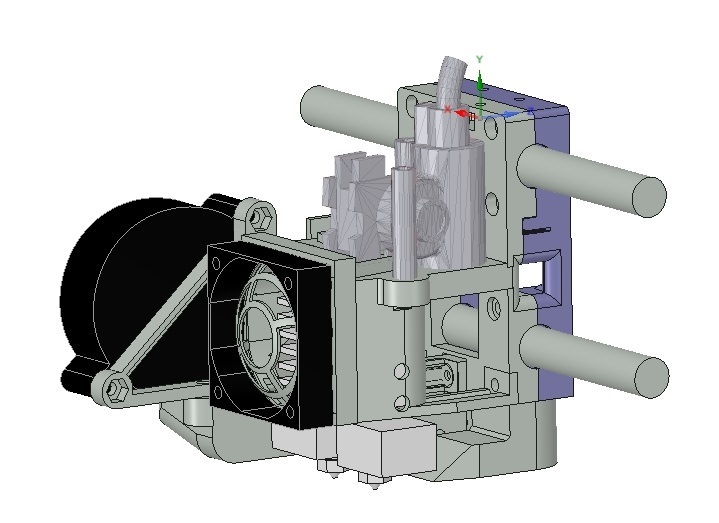 I found that the two Z-motors would get out of sync for a number of reasons so designed a 'dummy motor' / shaft holder for the right hand motor then replaced the left hand one with a dual shaft motor and linked the two with a continuous belt. I had some challenges getting the config files for the Duet WiFi sorted but got there in the end with help from David (DC42) and others. M207 S1.0 F3600 T3600 Z0                                        ; Set FW retraction length and speed" 1.0 retract, 60mm/s, unretract 60mm/s, 0mm lift. The biggest problems I had were to do with the 2nd extruder (I had an extra E in the steps/mm setting), and the tool entries for the Chimera. The Z-probe and levelling also gave me some issues but we got it all sorted in the end! Initially there was both an X and Y offset between the two Chimera print heads and I had to adjust this in the tool settings in the config.g. The nozzles in the Chimera are 18mm apart but, for some reason, they print with an offset when I set the gap to 18mm and ) Y offset. With a bit of experimentation, the two nozzles lined up properly. This image shows the offset before I optimised it. How do you find the zesty nimbles? Do you think your set up could print soft / hard filament combos? A quick response and I'll try to add more detail later. If anything can print soft filament, the Nimbles can. It was what I bought them for at first. 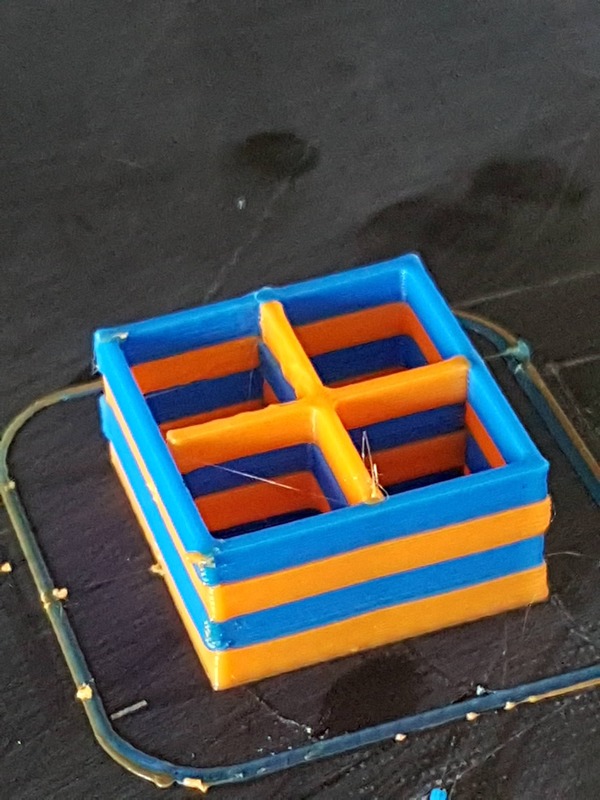 Before I upgraded this printer to Duet I did a very crude test (RAMPS and Nimbles) and printed some live hinges where the soft material was included into between two standard PLA parts in an H shape where the horizontal part formed a hinge. It worked perfectly. I have printed various soft filaments since - both on that printer and my larger delta that also uses a Nimble - and have no complaints. 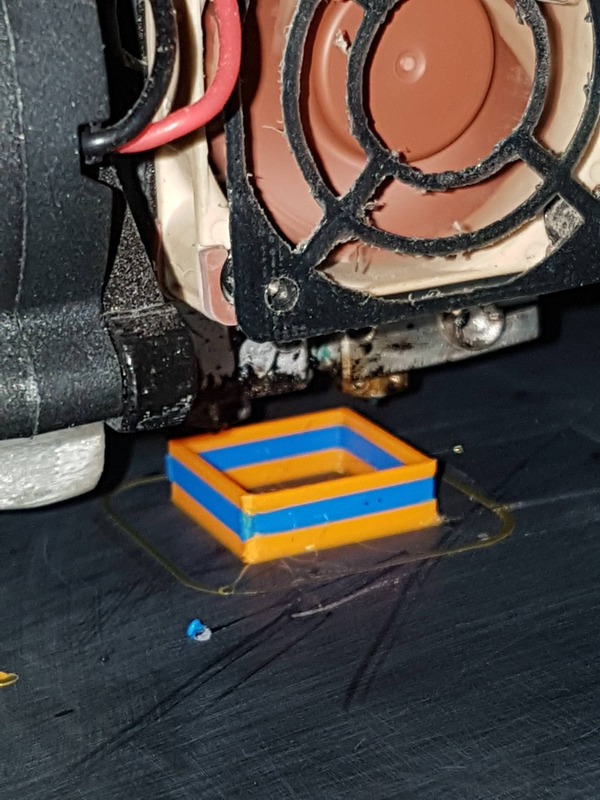 Later today I will provide details of the Shore Hardness of the softest filament I've printed with the Nimble - it was more like an elastic band than filament! The softest filament I have used is Recreus FilaFlex Original 82A (Shore hardness 82 A) and eSun eLastic (Shore hardness 85A). Strangely, the eLastic one felt softer. Both worked flawlessly in the Nimble. Sorry for not replying earlier, just got out of hospital after a microdiscectomy! That sounds great news. Flex hinges, embedded gaskets for lids, etc are one of my main use cases for dual nozzle. I have several spools of Filaflex. I'd actually like something even softer if possible. I did look at the Chimera when it first came out, but felt it was not that different from my existing dual nozzle (PLA only) to be worth the upgrade. I am thinking of doing a build with either IDEX with titan aeros, but their soft filament performance maybe isn't the best. Your nimble set up looks very nice. Did you have any issues with heat creep on the Chimera over long prints? OK, on your glowing recommendation of the zesty, I've just put in an order at E3D for a Duet Wifi and a chimera! 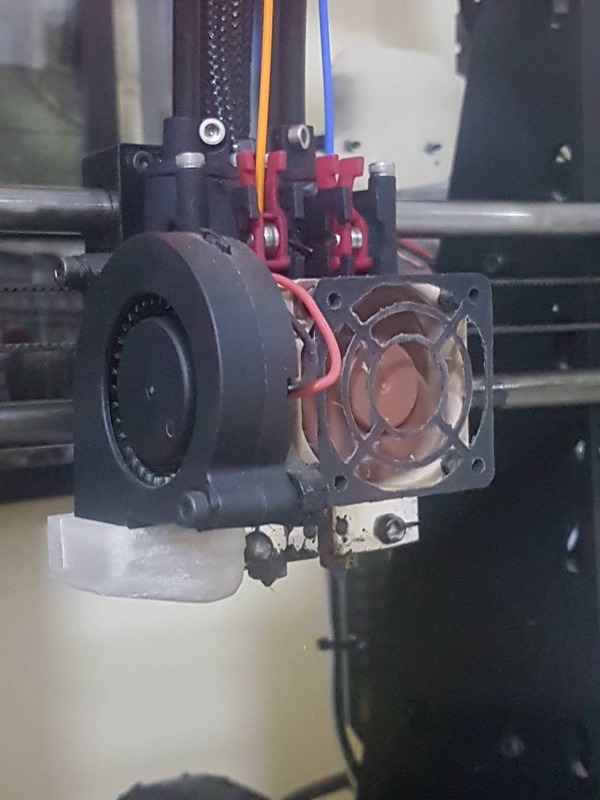 Going to upgrade my aging and unreliable K8400 to something that can finally print flexibles properly, with support via the dual nimble zesty. Decided on the Snap scaffold filament from e3d for support filament. The zesty nimbles seem to have some supply issues currently, so I'll have to go ahead get it set up without them. So looking forward to quiet stepper motors! It's a good idea not to change too many components in one go anyway, it makes troubleshooting easier.